Whether you’re French, Croatian, English or even Italian, it’s been a summer of football to remember. It’s a shame to begin this list with a negative, but aside from Portugal vs Spain and France vs Belgium, we didn’t see too many genuinely high quality games of football at this tournament. That’s not to say a football match can’t be entertaining unless both teams are firing on all cylinders, and sometimes the best spectacles are riddled with defensive errors and poor finishing, but it’s hard to deny that international football has fallen some way behind its club equivalent of late. On paper, nations like Russia, Denmark and Sweden should have no right to make it as far as a World Cup quarter-final, but the lack of quality across the board meant it felt like anyone could beat anyone at this tournament, and that randomness made things a lot more interesting. Plus, we’ve all had a laugh at Germany’s or Spain’s or Argentina’s or England’s or Neymar’s expense this summer, and what would football be without schadenfreude? Participating at a World Cup is a wonderful thing and the opportunity to be involved should be open to as many nations as possible. But that doesn’t mean we should dilute the quality of the competition even further by inviting an extra 16 teams to future tournaments. When it comes to the World Cup, 32 is the magic number and this year, only one or two whipping boys were present at the party (we’re looking at you, Panama and Saudi Arabia). If anything, FIFA should probably be looking to reduce the number of teams at the World Cup, and they only need to look at what expanding the European Championship from 16 to 24 did to that tournament two years ago. All killer, no filler, please. When FIFA announced, mere months before the tournament began, that they’d be diving head first into VAR at the 2018 World Cup, it seemed like a recipe for disaster. But in reality, it actually worked pretty well. The disruption to the flow of play was minimal, it gave referees more conviction in their decision making and brought a greater degree of fairness to the game. It’s also made everyone look like they were playing charades, which is a bonus. There are still a few flaws to be ironed out, but even the staunchest VAR sceptics must admit that it’s worked a lot better than expected. Like it or not, VAR is here to stay and if penalties are your thing, it seems there are going to be a lot more of more of them in future. In total, there were 29 penalties awarded at the 2018 World Cup, which is a whopping 16 more than we saw in Brazil four years ago. So if you’re a footballer and you don’t want to give a penalty away, might we suggest you stop making fouls in the penalty area? There’s a new sheriff in town, and there’s nowhere to hide anymore. Germany became the third World Cup holder in a row – after Spain and Italy – to be eliminated at the group stage this year. It’s a curious phenomenon. How can a team go from greatness to hopeless in just four short years? Is it complacency? Or does those gold shields sewn onto the shirts weigh those wearing them down, both literally and metaphorically? Whatever it is, France had better guard against it when they head to Qatar in 2022. Growing up, many of us always hoped this day would come. It always felt like an impossible fantasy – an (apple) pie in the sky, if you will – but the magical summer of 2018 is proof that if you want something hard enough, that if you close your eyes and will it into existence, even your wildest dreams can one day come true. That’s right, you can now get McDonalds delivered to your home. England may not have won the World Cup, but a generation of English people rediscovered their passion for their national team and it was a beautiful few weeks. In many ways and in many households, football did come home this summer. So long England, and thanks for all the memes. Disagree? Try telling it to this guy. Belgian TV station La Deux pioneered a new hologram technology during this tournament which made post-match interviewees look like they were sitting in the studio, even though they were over 5,000km away in Russia. NBD just a post-match interview with hologram Axel Witsel who looks to be in the damn room. It’s all a bit too Total Recall for our liking. Make it stop. What with Lionel Messi’s struggles with Argentina and Cristiano Ronaldo’s goals for Portugal, the early part of the tournament was dominated by tedious talk of which of them deserves to go down as the greatest footballer of all time. Boring, wasn’t it? In the end, neither of them added a World Cup winners’ medal to their extensive collections, and there’s a good chance they never well. Maybe we should just appreciate them both equally and end this nonsense once and for all? 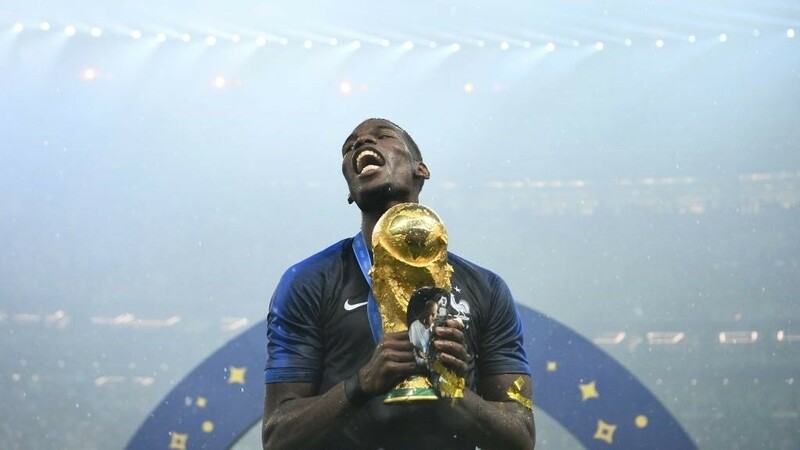 He’s won two Ligue 1 titles, the Coupe de France, the Coupe de la Ligue and now the World Cup. He’s the most expensive teenager ever, the first teenager to score in a World Cup final since Pelé in 1958 and this year, he was awarded Young Player of the Tournament. 126 senior games, 56 goals, 33 assists. Kylian Mbappé is still only 19-years-old. One day soon, Messi and Ronaldo won’t be around anymore, but this young man from Bondy is going to be dropping our jaws for many, many years to come. Modrić brought his excellent Real Madrid form to football’s biggest stage this summer, and though he’ll have been devastated to end the final on the losing side, his Golden Ball award offered a small crumb of comfort. He thoroughly deserved it too. The 32-year-old played more minutes and covered more ground than anyone else at the tournament, and was an absolute class act every time he stepped onto the pitch. You’ll do well to find a better midfield performance than his against Argentina in the group stage. They don’t call him the Balkan Cruyff for nothing, and we think Johan himself would approve. After refusing to come on as a substitute in the dying minutes of Croatia’s opening game against Nigeria, AC Milan striker Nikola Kalinić was promptly sent home from the World Cup in disgrace. That one act of defiance cost him the once-in-a-lifetime opportunity to play in a World Cup final and there’s a good chance he’ll never get called up to the national team again. I want you to meet Nikola Kalinic. He came to the World Cup as part of Croatia’s squad. He’s a talented striker. He reportedly refused to come in as a sub in the group stage win over Nigeria. Don’t be like Nikola Kalinic. Iranian full-back Milad Mohammadi found that out the hard way when he tried one during his side’s group stage draw with Spain and made himself look a right idiot in front of the watching world. Just throw the ball in like a normal person, it’s really not much to ask. That clip above isn’t the only bit of divine intervention we witnessed during this World Cup, and it makes you think maybe the big dude up in the sky is listening to our prayers after all. For the first time at this World Cup, photographers were actually positioned on the roof of the stadium, and some of the photos they took were incredibly strange. France’s triumph this summer means 12 of the 21 World Cups staged throughout history have now been won by European nations, with the other nine going to teams from South America. Given the amount money that’s been pumped into the development of football in Europe over the years, it’s hardly a surprise that it currently rules the roost. But the big question remains, just who will be the first nation to break Europe’s and South America’s World Cup hegemony? The United States are currently at the beginning of another cycle, while the African and Asian nations who participated at Russia 2018 were about as far away from winning it as ever. Whether you think Russia 2018 was the best World Cup ever or not is all a matter of opinion, because the World Cup is always brilliant. It isn’t just the best football tournament on the planet, or even just the best sporting event. The World Cup is the best thing in the world, and it has the power to bring people together like nothing else. The next one kicks off in Qatar on 21 November 2022 – exactly 1590 days from now – and we’re looking forward to it already.